San Francisco Municipal Railway (generally known as Muni) is the local transit system in the City of San Francisco. It operates bus and rail lines (Muni Metro, cable car, historic streetcar) and serves all districts in the city. The transit system connects with regional transit systems such as BART, Caltrain and Ferries. 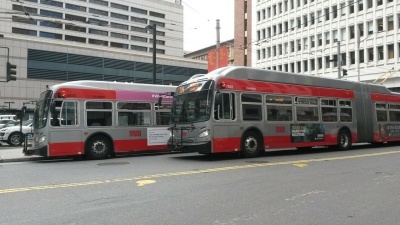 Muni is governed by the San Francisco Municipal Transportation Agency, which also manages the city's parking and taxis. Enter the Stop ID (shown on the bus stop sign) above. See Muni Metro and F-Market & Wharves for accessibility information specific for those lines. Cable Cars are not accessible.